Thanks for viewing my blog! Best day ever! A big thank you to patrons of our website and the readers of this blog! The St. Clair Publications site itself has had 202,600 hits since it was reformatted by our wonderful graphic artist, Kent Hesselbein, and the blog, put up later, has had well over 8,500 reads. Yesterday was the best day of all with 62 blog readers, and more already early this morning, thanks to the post about Michele Doucette! More great posts are just around the corner. Wonderful books are in process of preparation for publication, and now, with the addition of 100 new ISBNs, we are ready to take off! Stay tuned for more announcements, and go to our website at http://stclairpublications,com to shop our huge selection of individual paperbacks, sets, ebooks and gift certificates! If You Did This, Please Let Me Know! Usually late November and December sales keep my business and everyone else’s going for the majority of the year. 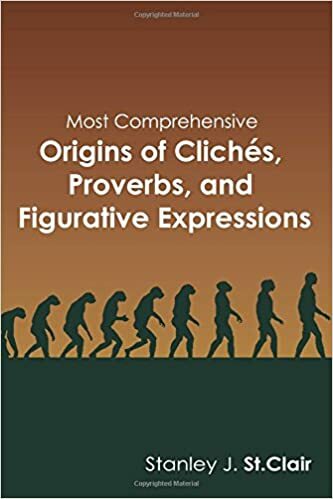 However, it has continued to amaze and delight me that Most Comprehensive Origins of Cliches, Proverbs and Figurative Expressions has sold in January at almost the same rate as December sales. And now, to top it all off, last night some one individual ordered 19 copies on Amazon.com, bringing the 24 hour total of combined sales to 25, well above daily average for that book during Christmas buying season. I want to thank this individual, if he or she will come forward, and present him or her with a free gift certificate for the stclairpublications.com site. If this was you,or you know who did this, please let me know. I will not embarrass anyone, merely show my appreciation. And again, thanks to everyone who has purchased any book from us!